Hi Alesia and Nancy, Thank you so very much for speaking with the families. I saw their faces light up when you spoke about how things are changing for kids in schools. Your story of determination and strength was certainly inspiring. My families got so much out of meeting you both. I am hoping we will be able to continue the discussion after the parents have read the book. (I heard the mothers of the older children saying that they were going to have their daughters read it.) Thanks again. After I first read your book, I felt like I really knew you. And I felt like I wasn’t alone in the world with the issues I experience on a daily basis. More important was what I took away from my experience with you this past weekend. You showed me that my disease does not have to define who I am as a person. I may be battling an illness, but I can still be an upbeat, loving, successful person. Alesia is doing it, and I can too! Thanks so much for sharing your story with all of us…I’m sure it will inspire those who haven’t had the pleasure of meeting you. I can understand why after all the years since your initial surgeries, CHOP continues to ask you to chat with young patients. What great strength of character. I work at Joe DiMaggio Children’s Hospital and see children like her fighting to survive everyday. I think that Everything’s Okay can give hope to their parents and provide strength to help them keep fighting even after they are exhausted by their own journey. I finally received & read my copy of Everything’s Ok … wow, I can’t believe everything you’ve been through from such a young age. You handled everything with such strength, grace & determination – more than most are capable of, especially as such a young woman. I truly enjoyed reading your story & feel so blessed that I not only know you, but that I was able to support your cause. You are an incredible human being & a true gift. You truly make the world a better place simply by being in it! WOW – thank you & I look forward to your signing my copy of your book ? I am amazed by your story and admire your accomplishments. I am fighting colitis, having been diagnosed in 1999. Some days are better than others, as I’m sure you are aware. I came close to having my colon removed last summer but then, by some miracle, started doing better. We’ll see what the future holds! Thanks for sharing your story and being an inspiration to others. It gives me hope, knowing that someone else with my disease has been able to lead a “normal” life! I have known Alesia Shute during the past two decades through her and her husband Cliff’s dedication to my research in maternal, infant, pediatric, and adolescent AIDS basic, clinical, and translational research. Throughout the years, Alesia has shown her kindness, generosity, and enthusiasm for those in need of help that suffer from debilitating and deadly diseases including AIDS and cancer. This book encompasses how Alesia came to have such compassion and kindness for others. Alesia is a colleague, friend, and wonderful supporter of The Children’s Hospital of Philadelphia and the Joseph Stokes Jr. Research Institute. It is a pleasure to participate in the dedication of her autobiography. 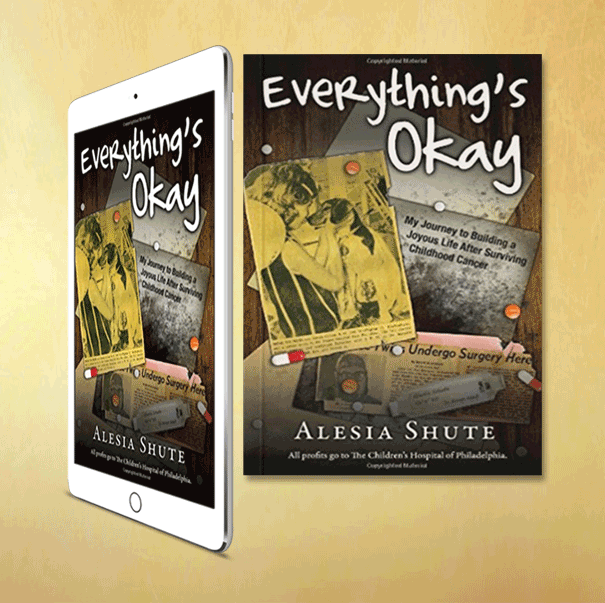 Everything’s Okay demonstrates [Alesia’s] strength and humanity in a very readable way. Readers see how her early days of as a cancer patient were so impactful. It was an easy read of a very personal part of her life that had me imagining each experience. Her vivid insights provoked me to want to keep on reading. Alesia, I opened your book about 4 hours ago, and four hours later, at 11:41 on a Friday night, I just finished it. I couldn’t put it down. What a wonderful story. Alesia, I always thought you were one of the most beautiful, strongest and powerful women I knew, and your book confirmed it! I thank God you’re still here to be an inspiration to everyone sick and healthy. Thank you for being in my life, too!! Love you, Chippy GREAT BOOK, GREAT FAMILY, GREAT HUSBAND! Writing fiction with imagined hurdles to overcome is one thing; writing a truthful account of the realities is quite another. Alesia Shute has captured the pain of an uncertain life that is always on the edge of collapsing and what it takes to survive tragedies not of our own making. She has done a masterful job and ‘Stand up and cheer’ is not an adequate description of her story, Everything’s Okay. Just finished reading [the comic book]. Such a sad and heartbreaking story. I got choked up again reading the comic book version. So proud of you, always. And I’m grateful that this story had a very happy ending. Some aspects, of course, brings back memories of my own – that dreadful tube among other things – but it is unbelievable (as my dad would say) how MUCH you had to endure both as a child and an adult. Of course, you know that your mom would be swelling with pride. I think I’m presently at 32,000 feet over Nebraska. I just finished Everything’s Okay, and I can’t thank you enough for passing the book along to me. It was one of the best reads I’ve ever had. The woman sitting next to me on the plane sees me tearing up while reading and has to wonder why a “comic book” is having that effect on me. But I love this medium that has been developed and hope it continues catching on. Sign up for my newsletter to stay up to date with upcoming events and press releases!